This event will honor the 15 years of distinguished service of Reverend Nicholas C. Triantafilou as President of Hellenic College Holy Cross. 100% of these proceeds will support scholarships for students, a cause which Father Nicholas has championed throughout his tenure. Hellenic College Holy Cross Presidential Scholarships are awarded to incoming students who exhibit superior academic and leadership potential and achievement. Scholarship recipients must demonstrate through academic work, extracurricular activities, and personal experiences a desire to strive for excellence in all aspects of their life. Their attributes reflect an exceptional commitment to faith, education, and service. 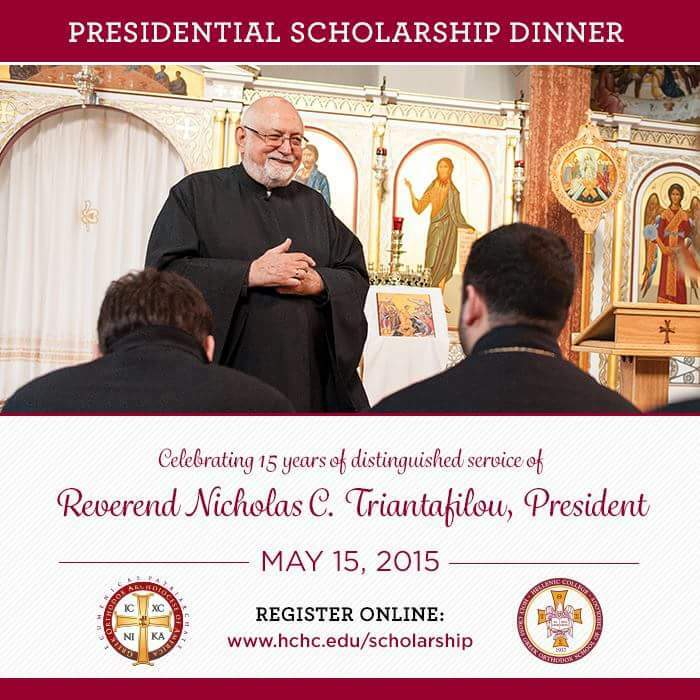 The Hellenic College Holy Cross Presidential Scholarship Fund has been established in honor of Reverend Nicholas C. Triantafilou, President of Hellenic College Holy Cross from 2000 – 2015. During his tenure, Fr. Triantafilou has worked diligently to attract and assist high-caliber students with funding based on merit and need. This initiative provides an opportunity for HCHC constituents to provide a financial and developmental investment in some of HCHC’s most outstanding incoming students.